Manipulation of Fruiting contains the proceedings of the 47th University of Nottingham Easter School in Agricultural Science, held at Sutton Bonington, England on April 18-22, 1988. The papers explore developments in the manipulation of fruiting and cover topics ranging from intra-plant competition to pollination, fruit set, and light interception and canopy manipulation. Genetic regulation and chemical manipulation of fruiting are also discussed. This monograph is comprised of 26 chapters divided into nine sections. The first section deals with the interactions that occur between vegetative and reproductive growth, focusing on source-sink effects and dry matter partitioning. The following three sections examine the sequential stages of producing a fruit from flower initiation, dormancy, and anthesis, through pollination to fruit set. Models that describe dormancy and flowering are presented; pollen incompatibility is considered; and the time available for pollination is analyzed. The physiology of fruit set is discussed together with methods to improve fruit set. The next three sections detail methods of manipulating fruiting, either physically by altering plant canopy structure and therefore light interception, genetically by breeding and selection, or chemically by the use of plant growth regulators. This book concludes with a look towards the future using genetic manipulation to alter fruit physiology. 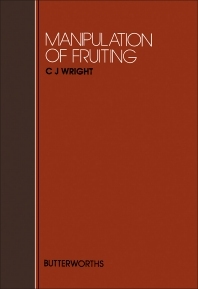 This text will be a valuable resource for crop researchers, plant physiologists, geneticists, and others interested in the state of research into fruiting.